This makes it very likely that the November '14 elections will be a referendum not only on Obamacare but also on the role of government in general. The forces of more limited government are likely to win the day, and that, in my opinion, would be a huge positive for the economic outlook. 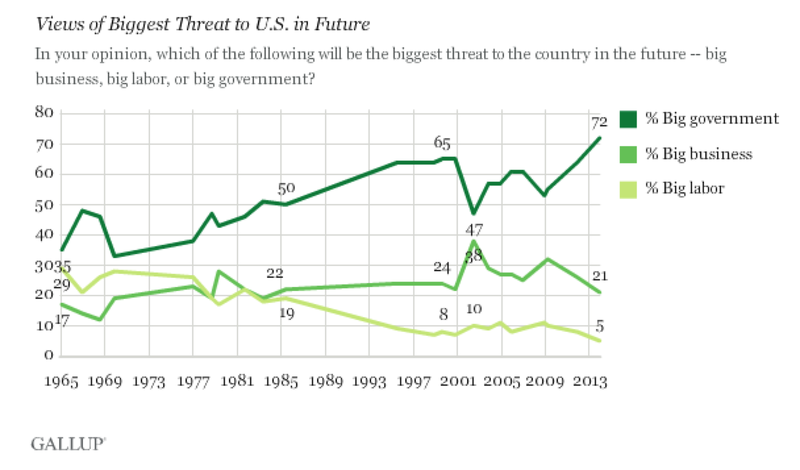 Personally, I am more terrified of big government Democrats and military-industrial Republicans than I am of al-Qaeda. The list goes on...and on...and on. I have no doubt that LMT has its army of lobbyists making sure that any piece of legislation affecting any of these agencies keeps the gravy train of gubmint money flowing, and that they use however much $$ is needed to get the "right" politicians re-elected. And what about other firms? Guess what, this list also goes on...and on....... Do ya think they are any less interested in riding the gravy train? Or that it's just a happy coincidence (for them) that the corporate-owned "lamestream media" goes nowhere near any of this (let alone ANY politicians)? All I ever hear over the airwaves is that "it's all the Dem's fault" and "it's all the Repub's fault". The term "divide and conquer" comes to mind. I present Corollary #1 from the Dispensation Economics Manifest: Jesus Christ, operating in dispensation, that is economic action for the fulfillment and completion of every age, PIVOTED, the world from the paradigm and age of liberalism into that of authoritarianism, on October 23, 2013, by opening the First Seal of The Scroll of End Time Events, thus enabling the Rider on The White Horse, who has a bow without any arrows, to empower the bond vigilantes to commence calling the Interest Rate on the Ten Year Note, ^TNX, higher from 2.48%, destroying fiat money, and to begin destroying fiat wealth, VT, as well as Nation Investment, EFA, and Global Financial Institutions, IXG. Under liberalism bankers, corporations, government, entrepreneurs, and investors of nation state democracies were the legislators of economic value and the legislators of economic life that shape one’s means and one’s ends. In contrast, under authoritarianism, currency traders, bond vigilantes and nannycrats working in public private partnerships and in regional governance, are the legislators of economic value and are the legislators that shape one’s means and one’s ends. Obamacare is at the leading edge of authoritarianism replacing liberalism. Obamacare is literally destroying America’s system of health care. And Obamacare is causing strong disinvestment out of Medical Devices, IHI, and Health Care Providers, IHF. Welcome to totalitarian collectivism; it’s the complement of regional governance; this being foretold by John The Revelator in Revelation 13:1-4. The Beast regime is rising to rule the world. Soon out of the Club Med crisis of sovereign insolvency and banking insolvency, it will establish policies of diktat of regional governance in every one of the world’s ten regions, and schemes of totalitarian collectivism in every one of mankind’s seven institutions. Both 2014 and 16 must break totally for the Conservative movement, as Beltway RINOS will do little when in power other than to maintain the status quo..
Well, those numbers do not include 3.7 million vets now getting monthly disability checks from Uncle Sam, paid for by income tax payers. It reminds me of that crazy old Phil Gramm line during the Clinton health care debate: "No government run health care, but keep your hands off my mamma's Medicare." No really. A US Senator actually said that.